Kevin Paredes/Photo Editor Binghamton University joined other schools and institutions across the globe on Wednesday, April 4 in commemorating the life of Martin Luther King Jr. The Clock Tower bell rang 39 times at 7:05 p.m., marking King’s 39 years of life. 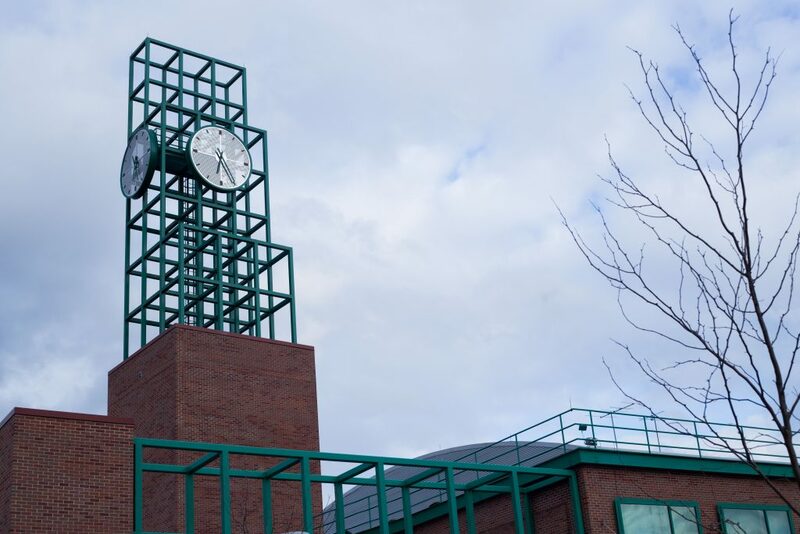 Binghamton University’s clock tower bell rang at 7:05 p.m. this past Wednesday, joining college campuses and places of worship across the globe in commemoration of Martin Luther King Jr., a prominent civil rights leader who was killed 50 years ago, on April 4, 1968. The National Civil Rights Museum’s bells began at 7:01 p.m., the approximate time of the assassination. Bells in Memphis, Tennessee, where King was assassinated, then joined at 7:03 p.m., followed by bells across the nation at 7:05 p.m. Bells rang internationally at 7:07 p.m. Each bell rang 39 times in honor of King’s 39 years of life. SUNY and CUNY campuses across New York participated in the commemoration as part of a statewide initiative lead by Gov. Andrew Cuomo. SUNY Chancellor Kristina Johnson applauded the efforts in a press release. The National Civil Rights Museum livestreamed reflection events across the nation on its website. At BU, students also could view the livestream in the Multicultural Resource Center (MRC) and the Q Center in Glenn G. Bartle Library. King was assassinated at the Lorraine Motel, which is now the location of the National Civil Rights Museum. According to the museum’s website, the courtyard program was free and open to the public. Events included daylong tributes through music, dance and spoken word as well as a wreath-laying ceremony and ecumenical liturgy from the balcony of the Lorraine Motel. Jose Maldonado, a diversity fellow in the Division of Diversity, Equity and Inclusion and employee at the MRC at BU, spoke to WBNG about the importance of remembering King’s mission. “Any time that you have a civil rights leader such as Dr. King, you want to be able to kind of preserve his message, his goals, his initiatives as somebody to help move our society forward in a better place, especially when it comes to diversity and multiculturalism,” Maldonado said. King led the historic March on Washington for Jobs and Freedom in 1963, which highlighted racial inequality in the country and was the site of his famous “I Have a Dream” speech. King is also honored annually at BU through events like the Martin Luther King Jr. Day of Service and Martin Luther King Jr. Week of Welcome Celebrations. “We want to look back at this time and really learn from this tragedy, but also really make sure that we are really understanding what Dr. Martin Luther King did in his short time as a civil rights leader and really try to propel that for many years to come,” Maldonado said.